We have a passion for Vespas that borders on obsession. Our large collection has 100 restored vintage Vespas in Vietnam and a small fleet of shiny new Vespas in Cambodia to give you the Ride Of Your Life. 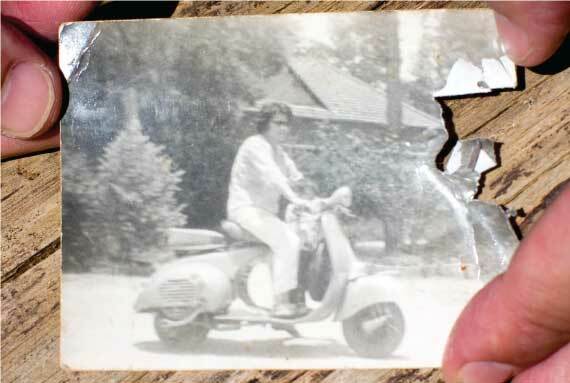 Ever since the French influence in what was then known as Indochine (Cambodia, Laos and Vietnam), Vespa scooters have been the popular and stylish transportation of choice throughout the region. Even after the independence of the former Indochine countries, the tradition has persisted to this day and local seniors and youngsters alike all know what a Vespa is and that Vespas are cool! The French were first responsible for bringing Vespas to Vietnam, and after they were expelled in the early 1950’s, their Vespas remained behind and quickly became a quintessential part of the Vietnamese culture. After the end of the American War in 1975, the Vietnamese government isolated its economy from outside influences, thus causing the Vespas to become status symbols for those who could afford them. With no new replacements available, locals had to maintain these machines as best they could, and they became experts at understanding the secret workings of the fickle Italian two-strokes. When Vietnam opened its doors once again to foreigners in 1990, locals discovered a whole world of shiny new – and cheap – Japanese and Chinese models. The hand-me-down Vespas were discarded and left to rust, forgotten, salvaged for scrap metal and spare parts. All of the citizens were lining up to sell what they thought were old, useless motorbikes. Beyond Vietnam, however, the rest of the world was rediscovering the classic style of the Italian scooters, especially those from the so-called Golden Era of production, the late 1960s and early ’70s. Enthusiasts and riders everywhere were once again crazy for the distinctive wasp-like body design (“vespa” is Italian for “wasp”) and the early model’s unique two-stroke sound. 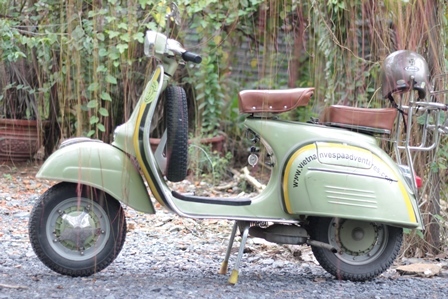 Here at Vietnam Vespa Adventures we pride ourselves on using Vespas that all hail from that Golden Era on our tours. When you go on a tour with us, we want you to get a locals perspective. As you ride one of our bikes, you are riding on a bike that has been in this country for 40+ years. By maintaining the bikes, we believe that we are maintaining this motorbike culture and that our tours can help our guests have a once in a lifetime experience and feel what it was like to zoom around Saigon and Vietnam on a vintage Vespa. Cambodia Vespa Adventures continues that tradition and solely elegant Vespas are used for our tours. The wide rear tires and direct traction ensure a safe and surprisingly stable ride even over the challenging countryside roads where our tours venture. 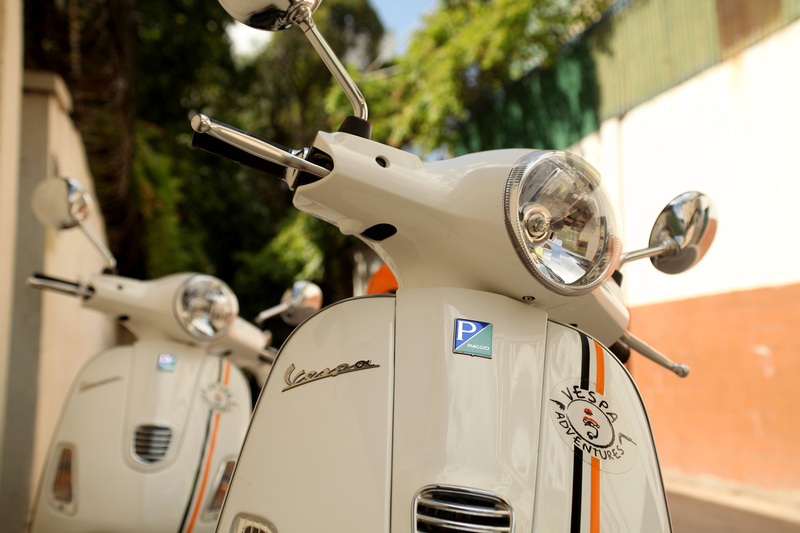 Our Vespas combine elegance with high-tech savvy. The four stroke engines of our Vespas are of the LEADER family, which stands for Low Emission Advanced Engine Range. Unlike any other bikes and scooters that you see on the Siem Reap roads, our new Vespa scooters are certified to comply with the strict Euro 3 emission standards.